Carpano Punt E Mes Vermouth is a popular Vermouth and Aperitifs available from DrinkSupermarket.com in 75cl to buy online. Visit DrinkSupermarket.com for the best price for 75cl of Carpano Punt E Mes Vermouth or compare prices on our other Vermouth and Aperitifs products. 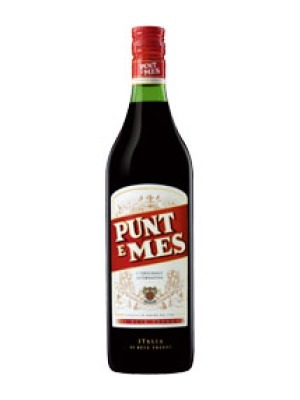 Cited as a benchmark and classic version of vermouth by the Oxford Companion to Wine, Punt e Mes (Poont eh Mehss) is one of the world's most popular red vermouths. Not overly cloying like the many commercial vermouths, it can be served straight up, used to make red Martinis, mixed with gin to make classic Italian cocktails like Negronis and Americanos, and it is also excellent when served with fruit juices, sparkling mineral or tonic water. With an aroma of wormwood and hints of bitter herbs, Punt e Mes is a vermouth in its finest form. Its name ('point and a half') in the dialect of Turin, came from the day when an absent-minded stock exchange agent called out the trading floor term in old man Antonio Carpano's bar, asking for a vermouth with a half-dose of bitters. The concoction that evolved as Carpano Punt e Mes, is coffee-coloured, and based on white wine aromatised with a secret recipe of dozens of herbs and spices. Served over the rocks with a splash of soda, it is exotic in a surprising way: first a taste of cola-like sweetness, then sharply bitter at the back of the tongue, with a complex web of tastes in between. Where to buy Carpano Punt E Mes Vermouth ? Carpano Punt E Mes Vermouth Supermarkets & Stockists. You can buy Carpano Punt E Mes Vermouth online in most retailers and find it in the Vermouth and Aperitifs aisle in supermarkets but we found the best deals online for Carpano Punt E Mes Vermouth in DrinkSupermarket.com, TheDrinkShop, and others. Compare the current price of Carpano Punt E Mes Vermouth in 75cl size in the table of offers below. Simply click on the button to order Carpano Punt E Mes Vermouth online now.